I sent away to the Ancestors of Dover Limited 2000 for some background on the McIlree name. According to their research, the name is of Irish origin derived from the old Irish name of Mac Giolla Riabhaigh which, means the son of or descendant of 'the red haired man'. In some parts of Ireland the name has become MacKilrae and in Scotland, and now also in Ulster, it is often McIlwraith or McIlrrath. ARMS:- Purpure a saltire between in chief a gallery sails furled, oars in action in base of a rod of Aesculapius in dexter flank a stag's head caboshed and in sinister flank an eagle displayed all argent. CREST:- a dexter arm in armour couped at the elbow proper, the hand holding a cross crosslet gules. Another member of the family was told by an Irish Scholar that the name means 'the fair haired servant to the king and that we served as message takers for the O'Neils of Ulster at their Headquarters in Tullahog. On a personal note, all the males on my side of the family have fair hair and none that I know of have red hair but that unfortunately doesn't prove the argument one way or another. I would also add that from looking at old birth, death and wedding certificates there was often an 'a' used or dropped in MacIlree/McIlree and it is extremely likely that the two names originate from the same name (although I am not sure which was the original). Also, as was common in older times many of the McIlree sons were named after their uncles and daughters named after their aunts. This can sometimes lead to confusion when looking through the family tree but can help when trying to search backwards for siblings. Following the above information, I received a very welcome reply from David McEllrea with the following information. His information re-enforces my own views that tracking the family history is a complicated business and fraught with problems. As a fellow researcher of our family name(s) I thought I might respond to your webpage. My name is David McElrea, and my family come from Co. Tyrone, N. Ireland.A number of years ago I asked a company similar to the one you used to provide me with a Coat of Arms etc. for our name (McElrea and McIlree both come from "Mac Giolla Riabhaigh"-- we are related, if distantly).The company gave me the same information that was given to you, and, one way or the other, the accuracy is questionable. I shall address some potential errors, and then try and help you along in your research (I'm still working on it myself). McElrea/McIlree comes from the Irish "Mac Giolla Riabhaigh" (This agrees with my research).Mac Giolla Riabhaigh translates into the English as "Son of the Brindled Fellow"-- Mac (Son of) Giolla (Fellow) Riabhaigh (Brindled, Tawny, or Speckled)-- (disagree with the interpretation given you)!The name "Mac Giolla Ruaidh" (McIlroy), which is completely different from our own name in the Gaelic, means "Son of the red haired fellow". The Coat of Arms/Crest/Motto they have given you belongs to the Clan MacDonald (of Sleat, I believe, but I could be wrong). Here is where it gets complicated.There is a MacDonald sept (family belonging to the clan), called "Mac Ghille Riabhaich", often translated MacIlwraith or MacIlreach. 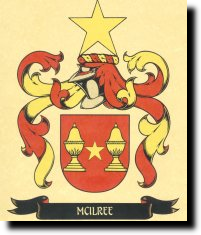 Strictly speaking, even if we were from this sept we would not have the right to claim the MacDonald crest.The above name is Scottish, descended from a Scottish family.McElrea/McIlree is almost certainly Irish in origin, as I have said, from Mac Giolla Riabhaigh. It is unhelpful to think of the name becoming one thing in Ireland and another in Scotland-- the Gaelic meanings are the same, but the ancestry is not.A note on the Scottish and Irish Families:Now, on to more helpful topics...What we can be fairly sure of:The Mac Giolla Riabhaigh are a sept of the Ui Fiachra tribe from Connaught (the West of Ireland). The Ui Fiachra (or Ui Fiachraich) were the descendants of Fiachra, son of Conn of the Hundred Battles, High King of Ireland. For a time, this tribe ruled Connaught.The Mac Giolla Riabhaigh were recorded as having their stronghold in Skreen, Co. Sligo, but they diminished as a power in the late Middle Ages.What might be:One of the Ui Fiachra kings, Guaire, began a family who came to be known as the McGuires. A branch of the McGuires, the O'Clery's (the similar sound of the name is coincidental) had at least two men named "Mac Giolla Riabhaigh". It is possible that we are descended from one of these men.Some of the Mac Giolla Riabhaigh stayed in Sligo, where their name is now often anglicised as McIlrea. Others (I think) moved to Tyrone, via Derry, and the name was changed to McElrea. There are other variants as well, including your own.As to our Coat of Arms? I don't know at this point-- it is possible that we didn't have one as this was an English concept that was only gradually adapted by the Irish.If, in your research, you find anything else, I would love to hear from you.One final note-- the Coat of Arms bearing three fish is sometimes suggested as our Arms-- it is not. It belongs to McIlroy (Mac Giolla Ruaidh).A Note of Caution:Nothing is 100% certain in Irish (particularly Ulster) genealogy. Some have assumed that our Families are Scottish in origin because they (at least the McElreas) are Protestant rather than Catholic.Contrary to popular opinion, many native Irish families converted to the Protestant faith at the time of the Reformation. The "faith" of a family is not a reliable guide as to origins.In fact, because of tensions between the native Irish and the Scottish settlers during the Plantation, I would be surprised if any Scot would "Irish-ise" his name-- and our names are Irish in flavour, not Scottish. Generally, MacIlwraths have kept their names and their Scottish identity.As far as I can see, the only way we could be Scottish in origin is if our ancestors came from Scotland hundreds of years before the Plantation and became "Irish". I think the Ui Fiachra is the simplest and most likely explanation.I hope this has been of some help, and not too confusing or discouraging. Do you have anything to add? Can you confirm or refute any of the above? Do you have any old pictures of the McIlrees or tales from the past? If you do, please contact me by email and we can build up the pages for the next generations. A further take on the family history is given below. My thanks to Edward McIlwraith for this information. The big problem is which clan did we originate from or were we simply a new clan created by a misspelling or by transit from Scotland to Ireland or vice versa. The more research I do the more I find similar mottos, crests and derivitives of the spelling. Having seen your page I thought you might be interested to know the following, not sure about the accuracy of the article. History Magnus Barefoot, the King of Norway, sailed across the North Sea in 1098 to re-establish his country?s power in Celtic lands. He made an agreement with Edgar, King of Scots, that he would settle for all the islands of the west coast he could reach whilst his boat's rudder was in a fixed position. He then proceeded to have his boat towed around by his men and claimed not only the isles but the peninsula that is Kintyre. Fifty years later King Somerled took Kintyre and the islands back. When King Somerled was killed fighting Malcolm IV in 1164, he was succeeded by his son Dougall. From Dougall would come the Clan MacDougalland from Dougall's son Ranald came a grandson Donald, progenitor of the mighty Clan MacDonald. In 1424, James I returned from English imprisonment to begin his Scottish reign with a sweep of executions, imprisonments and punishment for all who had not supported him. In 1427 he summoned the powerful of the Highlands to a parliament in Inverness. In place of his father Donald, Alasdair MacDonald and his mother the Countess of Ross went to Inverness and were immediately imprisoned. Others, their cousin Alasdair MacDonald of Garmoran among them, were executed. When he was released, Alasdair of the Isles immediately raised a rebellion in 1429 and burned Inverness.James I jailed him again in Tantallon. After two years the men of the Isles rose again and James I agreed to free Alasdair on his word of obedience. He became Earl of Ross in 1435 and his people had a prosperous era where literature, history, Greek and Arabic sciences flourished. When Alasdair died, however, his son John entered into the secret Treaty of Ardtornish with England's Henry VIII in 1462. The arrangement was that should England defeat the Stewarts, then English-speaking lowland Scotland would be ruled by the Douglases. All the Gaelic-speaking North would be ruled by himself, with the King of England as his sovereign. In 1476 the treaty was discovered and John of the Isles lost his mainland possessions.By 1495 the Lordship was revoked and anarchy and violence swept into the Highlands as the Campbells, Gordonsand others tore off strips of MacDonald land for themselves. A Gaelic poet sang:-It is no joy without Clan Donald It is no strength to be without them For sorrow and sadness I have forsaken wisdom and learning. The above articale dictates a little about the orgins of the MacDonald Family.Also i found a little other information.The Motto is: "Per Mare Per Terras" meaning "By land and By Sea" (approximately)I have found a couple of crests and badges on the internet relating to the sept of McIlwraith from the clan of MacDonald, though is also related to the clan of Fraser, whose motto is "Jesuispret" meaning "I am Ready" though the clan badge is VERY similar to the clan badge of MacDonald. The information I have found suggests that septs had variations of the crests and badges worn by Clans, since septs are "branches" of the same family... I think. Not too sure. There is too much inaccurate information in the world!!! Maybe you already know this. Hope this helps.